Canadian author Jes Battis earned a Ph.D. in English and is currently a postdoctoral research fellow at the City University of New York. He has published numerous academic articles. Read excerpts of his fiction at Jes Battis’s website. CLICK HERE FOR MORE TITLES BY JES BATTIS. 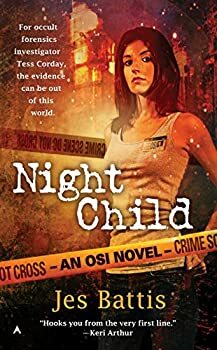 OSI (Occult Special Investigator) — (2008-2012) Publisher: Enter the night world of the OSI… OCCULT SPECIAL INVESTIGATOR Tess Corday, Occult Special Investigator for Vancouver’s Mystical Crime Lab, is used to seeing dead vampires. But there’s nothing ordinary about this case. Not the lab results on the cause of death. Not the teenage girl living at the address found in the vamp’s pocket, who may well be in thrall to a demon. And certainly not Lucian Agrado, the necromancer who is liaison to the vampire community. Agrado is supposed to be part of the solution, but Tess suspects he might be part of the problem. Soon she finds herself in the middle of a paranormal conspiracy that will change her life forever — and possibly end it.